Thousands of demonstrators flocked to the streets of Germany on Thursday ahead of the G7 summit in Bavaria. 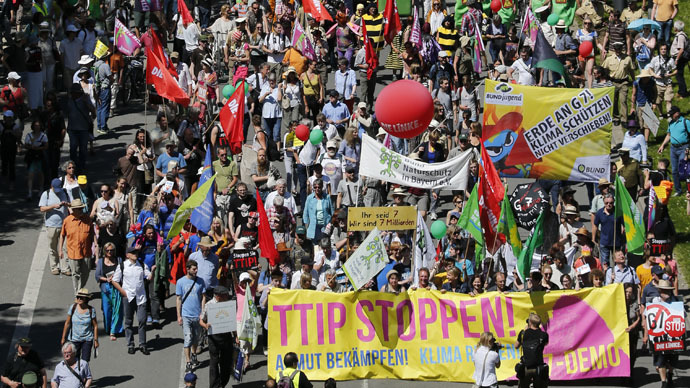 The main rally took place in Munich, with participants accusing world leaders of failing to act on major global issues. The demonstrators had a long list of complaints and demands for G7 leaders, ranging from poverty reduction to climate change and rescuing migrants in the Mediterranean. Some wore masks depicted the faces of G7 leaders while holding an “Even it up – Time to end extreme inequality” banner. A giant pesticide bottle was also part of the demonstration, protesting against Monsanto – the controversial agrichemical company known for its genetically modified organisms (GMOs). On the forefront of the protesters' agenda was the Transatlantic Trade and Investment Partnership (TTIP), a trade deal which is currently under negotiation between Europe and the US. Protests against the deal come as little surprise, despite it having Chancellor Angela Merkel's support. A recent survey found that around 43 percent of Germans believe the deal would be bad for the country, Deutsche Welle reported. The exact number of participants was unknown, though Munich police said before the rally that around 15,000 were expected. Meanwhile, organizers put the number between 10,000 and 30,000, according to Bavarian public broadcaster BR. The upcoming summit, scheduled to begin on Sunday in the Bavarian town of Elmau, includes the world's seven most industrialized countries – the US, Canada, Britain, France, Germany, Italy, and Japan. "The representatives of the richest and most powerful countries in the world lay claim to decide the fate of the entire world, without having any legitimization for this," Stop G7 Elmau 2015 wrote. Some 15,000 Bavarian police officers will be on duty during the event. Police spokesman Wolfgang Wenger called on demonstrators to act reasonably. The country has also implemented temporary border checks with its neighbors until mid-June. The protests come just one day after US forces were ordered to stay away from the G7 region, amid fears that servicemen may be attacked by anti-G7 protesters.